At the dockside lunch at Lloyd’s family reunion, his cousin Julie brought some adorable penguins made from black olives, carrots and cream cheese. They looked so cute, but were devoured in an instant. I admired her dedication to an hor d’ourve, as I am an ‘open a bag of chips as a side dish’ kind of person. For the barbecue after the Fourth of July parade, though, I thought I could make the effort. After all, it involved a fair amount of slicing, which is one of my favorite things to do. I even bought some dip to mix with the cream cheese filling to amp up the flavor. 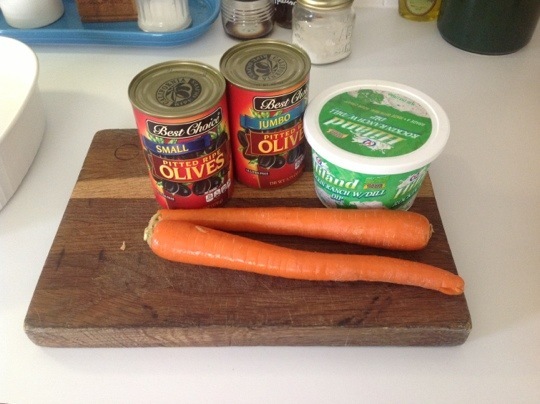 You slice carrots into rounds, cut a little wedge out of the round, stick it into a small olive. Then slice or scoop out a ‘belly’ from a jumbo olive, fill with dip, then poke it all together onto a toothpick. (See? It already sounds exhausting.) I decided to do everything in batches: all the carrots into rounds, all the wedges cut out, all the beaks into the ‘heads’, etc. Beak in head, beak in head, beak in head. We had other non-round toothpicks: weak little flat picks, or long ‘party picks’ shaped like mini-spears. I choose the spears for their resemblance to harpoons, but on several of the carrot rounds/penguin feet, the plastic point of the spear bent and compromised the bird’s stability. Grrrrrrr. I made up a dozen penguins and then got fed up. No oohing and ahhhing was worth this bother. 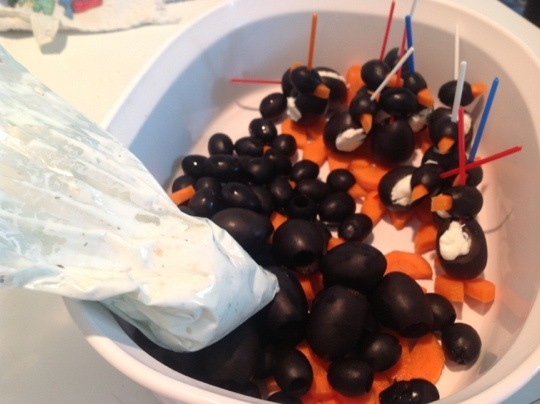 I threw the rest of the heads, feet, and unfilled bellies in the dish and called it The Great Penguin Massacre of 2013. When you ate one, did you eat it all at once, or did you pull it into pieces? I always bite the head off of Peeps. I imagine with these penguins you’d have to eat them feet first because of the toothpick. One gulp, like an orca. Hahaha! And some penquins survived … well, as long as you don’t count the harpoon thru their head. Ha! Lauren this is the funniest thing I ever read!! You get an A for effort though. I will think of you each time I see a can of olives. ha ha . Love you. Totally understand…all these AWESOME recipes circulating on fb…I ‘like’, I ‘save’, I think ‘I’m gonna try that’…and then open that proverbial bag of chips instead!